The role of staff involved with undergraduate admissions and recruitment has changed since the turn towards marketisation in higher education. This article focuses on the system in England following both a sharp rise in student fees and an associated tendency for the public university agenda and related social priorities, such as widening participation, to come up against more private and commercial priorities, such as business engagement, league table performance and internationalisation. Drawing on evidence from detailed interviews with admissions personnel, both academic and non-academic, across three disciplines within one higher prestige university, we revisit the notion of selectivity and the practice of selection. Tensions are revealed between two opposing approaches: a more traditional model of university admissions, as based on local knowledge and sensitivity towards underrepresented groups, and a purportedly merit-driven model, as driven by perceived market position. We explore the intricate and often unexpected ways in which staff reconcile their professed beliefs with their professional practices, and the complex identity work needed to renegotiate personal values in light of shifting institutional needs. Findings are offered as a microcosm for broader trends in the higher education sector. The research reported in this article emerges from a project called “Contemporary Admissions Practices in UK Higher Education”. It operates on the premise that the way in which selective undergraduate programmes choose between applicants may offer a useful lens through which to visualise some of the sector-wide changes in higher education policy. As discourses of university as a public good are replaced by the language of the market (Brown and Carasso 2013; Collini 2017), institutional priorities evolve accordingly (Giroux 2002). Access, widening participation and outreach activity remain central to strategic operations, partly because they help to legitimate the market turn (Rustin 2016). However, agendas more directly aligned with key performance indicators, income-generation activity and league table metrics (Hazelkorn 2015) now vie for institutional attention. By conducting in-depth interviews with admissions staff across three disciplines at one large university in England, we begin to build a picture of how ground-level professional identities are reshaped—and processes contested—in policy landscapes that position universities very differently within society. Around the globe, the job of university admissions staff is changing (Camara and Kimmel 2005). The English higher education system—where some agency remains to disrupt national policy and institutional strategy at the point of enactment (Ball 2015)—offers fertile ground for exploring issues of professional identity. Our research seeks to inform debates about how university admissions processes relate to social justice (Burke 2013; Mountford-Zimdars 2016) and to the contested notion of social mobility (Bathmaker et al. 2013; Chitty 2014). As the quote in our title suggests, findings do not point to a fixed binary, but rather to a dynamic, complicated arena in which actors reposition themselves frequently, and sometimes counter-intuitively (Winter 2009), while attempting to preserve personal integrity (Sheridan 2013). Through a preliminary organisational and social-structural analysis of one local context, we contribute to extant understandings of academic and non-academic staff identities within the field. Admissions is a high stakes arena (Bowen and Bok 2016). Initiatives aimed at maximising fairness (Schwartz 2004) and social mobility (Milburn 2012) in England’s higher education system have been commonplace for some time. However, concerns about fair distribution of places in higher education are familiar (Bolivar 2013), as are the cultural aversions to university of many young people from non-traditional1 backgrounds (Reay et al. 2005) and their fear of not “fitting in” (Reay et al. 2010). Evidence suggests that not all applicants have access to comparable cultural and social capitals (Mountford-Zimdars et al. 2016) and that universities may sometimes reproduce, rather than disrupt, socio-economic advantage (Roberts 2016). Admissions policy now comes under close scrutiny, both nationally (Milburn 2012) and internationally (Kotzee and Martin 2013; Westkamp 2013). Though institutional autonomy, particularly around selection, remains highly prized and guarded (Enders et al. 2013), some universities have adopted measures to “correct” for perceived lack of opportunity (Leathwood 2004), while others assure candidates that their application will be considered “holistically” and in its appropriate context (Jones 2014). In England, decision-making practices vary not only from institution to institution, but from discipline to discipline, and the process of assessing applications once they reach individual universities has been relatively under-explored, despite analysis by Zimdars (2010) and by Burke (2013). This is an area of increasing importance in England, which in 2012 witnessed one of the biggest hikes in the cost of university participation seen in the sector, with the annual tuition fee for most undergraduate degree programmes increasing from £3375 to £9000 (Department for Business, Innovation and Skills 2011). A growing body of research draws upon identity theory to understand better the effects of changes in higher education policy on academics’ identities, including Nixon (1996), Winter (2009), Billot (2010), Fanghanel (2012), McLean (2012) and Evans and Nixon (2015). Distinctions are drawn between staff whose identities can be broadly characterised as “academic managers” as opposed to those of “managed academics” (Winter 2009). Often identified in the literature are schisms between the policy environment and more enshrined aspects of academic work (Pifer and Baker 2016). Research has attempted to characterise and explicate these growing pressures, as “manager” ideologies demand performance in accordance with tightly measured, outcome-driven structures (Deem and Brehony 2005), while “managed” ideologies tend to align with more traditional notions of collegiality, independence and academic freedom (Henkel 2005; Rustin 2016). Fitzmaurice’s (2013) focus is on early academic identities and how they are shaped by notions of morality, while Sheridan (2013) explores the ways in which professional and personal identities evolve over time and become “mingled” in elaborate ways. Evans’s (2008) three conceptions of professionalism—demanded professionalism, prescribed professionalism and enacted professionalism—capture actors’ differing responses to changing education contexts and pressures, while individual conflicts are mapped on to wider trends in the sector by Cribb and Gewirtz to gauge the extent to which “academic self-identity and self-definition have become colonised by institutional performance ideologies” (2013, p. 345). In parallel, though more gradually, research has emerged into the professional role of non-academic staff in universities. The rise of the “third space professional”, tracked closely by Whitchurch (2006, 2008, 2012), is of relevance to this study because admissions personnel often fall into the gap between traditionally bounded academic and the non-academic roles. As Whitchurch notes of staff occupying this space, “rather than drawing their authority solely from established roles and structures, they increasingly build their credibility on a personal basis” (Whitchurch 2008, pp. 393–394). Meanwhile, incentivised by the inclusion of entry tariff and other under-contextualised attainment indicators in published league tables, English institutions remain mostly wedded to entry grades and the institutional prestige assumed to follow (Marginson 2006). This contrasts with Guinier’s position that universities should “take pride not in compiling an individualistic group of very-high-scoring students but in nurturing a diverse group of thinkers and facilitating how they solve complex problems creatively” (2016, p. 26), and with debates in the US literature that seek to reframe college admissions as “creating a class” (Stevens 2009).2 Reay goes further, arguing that “what we need is more radical action in terms of admissions, drawing lessons from affirmative action policies” (2015, p. 20). In light of these tensions, the analysis that follows draws occasionally on the notion of “sincere fictions”, as originally developed by race sociologists such as Feagin and Hernan (2000) to describe the ways in which white individuals reproduce societal mythologies while continuing to self-characterise as “good people” (Quinn 2011, following Winant 1994). We argue that this is sometimes analogous with the way in which admissions staff reconcile their professional requirement to appraise “merit” with their personal values and their interpretation of social justice. Taking the higher education system in England as our case study, we explore how undergraduate applications are handled within one university. We do this by profiling the staff involved. Who are they? How did they get their role? What place does admissions work occupy in their working lives? How do they interpret the relevant institutional and sector-wide agenda? To what extent is their professional practice inspired or compromised by their self-reported personal values? Our contribution is twofold: to shed new light on processes and practices that have to some extent remained veiled during recent structural shifts, and to identify some of the strains that emerge at ground level, exploring in particular what happens when personal identities and individual values clash with institutional policy. While previous studies have taken a quantitative approach to the outcomes of admissions processes (Bolivar 2013), we focus more qualitatively on the day-to-day practices and experiences of the individuals involved. Following Watson’s “autobiographical identity work” approach (2009) and Sheridan’s “narratives of the professional self” (2013), we draw on testimonies from multiple university staff to build a picture of how policies are enacted—and values negotiated—at the local level. We understand professional identity not as a static property, but as a fluid expression of accumulated stimuli, from both within the workplace and beyond (Jenkins 1996). In the UK, university applications are managed centrally by the Universities and Colleges Admissions Service (UCAS). However, once applications reach individual institutions, including the one investigated, decisions about whether to offer a candidate a place (and about the grades they must achieve before taking up their place) can be fully devolved, allowing a high level of disciplinary autonomy. Recent structural shifts—such as the introduction of tuition fees, league tables and New Labour’s widening participation agenda—have compelled universities to become more transparent in their allocation of places, with growing media focus on perceived inequity in admissions to higher prestige Russell Group universities (Milburn 2012). Staff therefore now face multiple demands: to recruit adequate numbers of students (for financial reasons); to recruit appropriately qualified students (to win entry tariff recognition in league tables); and to recruit a sufficient proportion of students from non-traditional backgrounds (to meet government and institutional targets). These pressures are in addition to the long-standing expectation that students have the academic ability to meet the pedagogical demands of their course. We selected one university in England, a member of the Russell Group, which receives over 20,000 undergraduate applications each year. Located in an urban environment, with several low participation neighbourhoods nearby, the university faces particular challenges to widen access within local communities as well as to maintain a strong international research profile. The reason we restricted our study to a single institution is to control for variables relating to university regulation and policy, thereby providing the most reliable and consistent basis possible for the study. Three sites within the institution were identified through a quota sample: an Arts discipline, a Social Sciences discipline, and a Physical Sciences discipline. Each operated under the same institutional code of practice for admissions, while retaining leeway to set its own entry requirements. At one of the three sites (Physical Sciences), formal interviews formed a core part of the selection process; at the other two sites, interviews were sometimes conducted to help reach a decision, together with consideration of written submissions and UCAS application material, such as the personal statement. The proportion of students educated in the state sector (relative to the independent sector) was comparable across the three sites, though the proportion of widening participation students (as defined by institutional criteria relating to socio-economic status) was slightly greater in the Physical Science discipline. However, the intention of the research was not to characterise admissions processes at discipline level; indeed, the three sites were selected only to represent a broad range of practices. We developed a semi-structured interview schedule with open-ended interview questions (“do you think that the way you do admissions is equally fair to all of your applicants?”) followed by unscripted prompts (“how do you feel when a colleague says something like that to you?”). To gather data around issues of personal identity and begin to explore possible connections with the notion of “sincere fictions”, we also asked continuation questions relating to participants’ values (“is that an approach to selection you’d personally favour?”) and probed their stated goals (“what kind of cohort balance would make you think that you’d done a good job?”), where appropriate. Answers allowed us to unpick each participant’s professed value system in terms of our conceptual frameworks, as well as to gather information about the nature of the day-to-day work at each site. Between three and five interviews took place at each of the sites, a total of thirteen interviews across the university. Each was recorded, transcribed and coded. The majority of participants reported being from a non-traditional background, perhaps because admissions work tends to attract such staff disproportionately. All of the non-academic staff that participated were university graduates. Only one of our interviewees reported having received any formal training for their role. When asked how they became involved in admissions, one said “reluctantly” and several others indicated that it was by chance, not design. Following Gee (2000), our research operates on the premise that the “kind of person” we are surfaces through such interactions. Our participants were generally open and forthcoming during their interviews, welcoming the opportunity to reflect upon an area of activity that they felt was usually taken for granted. We took a phenomenographic approach (Marton 1986) to interpreting the interview data, mapping the qualitatively different ways in which professional experience was described and personal identities and values implied. This approach has been used in previous research into higher education (Brown et al. 2016) and is discussed in detail by Tight (2016). Like many studies in the field of higher education, we draw on a Bourdieu’s work to consider relevant capitals (Naidoo 2004), the role of habitus, and how the move to a more market-based model affects the “rules of the [admissions] game” (Bourdieu 2000). The main ethical issues were informed consent, right to withdraw, confidentiality and inconvenience. To address these issues, participants were (a) provided with an information sheet which outlined the purpose of the research, and given at least two weeks to consider whether they wished to take part; (b) advised that their participation was entirely voluntary, and that they could withdraw at any time without giving a reason; and (c) given a pseudonym and assured that great care would be taken to disguise their discipline area so that individuals could not be identified. All data was stored securely and personal details were changed to protect anonymity where necessary. Full approval was given by the lead author’s university (Research Ethics Committee 5: Project Ref 12,413). Findings revealed broad consensus across several important topics, including the importance of the admissions role and its under-recognition within the institution. Most participants freely made connections between their personal histories, their professional identities and the way in which they execute their current role. However, the nature of those connections differed from participant to participant, and at all three sites, disagreement arose about the relative importance of widening participation, the mechanisms by which fairness in admissions is best achieved, and the usefulness or otherwise of preferential measures for non-traditional applicants. Throughout his interview, Graham cites aspects of the admissions process that he believes disfavour non-traditional applicants. Decontextualised attainment data are dismissed (“a much more reliable indicator of the school you went to than of your actual intellectual ability”) and personal statements critiqued (“it’s a bit like / I don’t know / from my A-level sociology days / it reminded me a lot of Bernstein’s restricted and elaborated code work where Bernstein was interested in the way in which social classes use language differently”). Most pointedly, a counter-hegemonic position on social engineering is taken (“actually it’s already happening / you know / you’ve got an intake where / what is it / on average if you go to an independent school you’re five times more likely to get to a university than if you don’t?”). Rather than censure colleagues less committed to widening participation, Graham frames them as cosseted, drawing heavily on his own values and experiences to fashion a professional identity that allows him both to rationalise and operationalise his vision. As a time-served and respected member of staff, Graham is able to preserve an unusually high level of individual autonomy over the admissions process, his academic capital lending him a platform from which to persuade others that his approach has most integrity. The tone set by Graham is mostly followed by his colleagues. Ruth is a senior non-academic member of staff who has been working in admissions for over ten years and draws heavily on her knowledge of local (lower performing) state schools—and of the difficulties that many face—to extend opportunities: “I’m in this area geographically and I suppose in terms of feeling a sense of belonging / I know the local colleges and I’ll occasionally have people come through that I know / I will say ‘I must not interview this person / they must be seen by somebody else’.” She shares Graham’s sense of vocation, expressing it less guardedly: “we don’t just want a lot of independent posh kids because a lot of us are not”. Of Graham and her other colleagues, Ruth notes that they “tend to be quite political / very sort of egalitarian in their politics and in their outlook / and so they will really work hard to try and kind of get a better social mix”. However, not all of our interviewees in Graham’s discipline were supportive of his approach, and pragmatic notes of caution were sounded by two junior colleagues. For example, although Tamsin acknowledged disproportionality in the number of students recruited from the independent sector, she did not accept that any “correction” was needed. Tamsin works alongside Graham and Ruth, relatively new to her role as a non-academic assistant at the site. Rather than frame imbalances as an equity issue, Tamsin refers to the importance of “massive key feeder schools” (by which she means independent schools that supply the university with large numbers of students) to the recruitment process. She also picks up on the reputational risk of not treating every applicant identically: “if we were to be in conflict with [the independent schools] over what they would term ‘positive discrimination’ then we’re on a hiding to nothing really”. A fourth colleague at the site echoes Tamsin’s sentiment. Helen, another non-academic member of the admissions team, describes her background as “very under-privileged working class” and reports that she “identifies with looking for people with potential [that] haven’t been to these fantastic schools”. However, like Tamsin, Helen then draws on her own experience of disadvantage as reason to reject compensatory practices that she regards as unfair: “you can’t discriminate the other way / you can’t penalise somebody for having had advantages”. For Tamsin and Helen, the notion that any applicant is more deserving of a helping hand is misplaced, even patronising, and their own experience of hardship only raises suspicion about admissions decisions that they believe diminish hard-won attainment successes. Within a single site, therefore, we see different and sometimes conflicting professional identities emerge even among colleagues with comparable educational histories. While Graham sets the tone with rhetoric about social justice, Tamsin and Helen—both equally able to flex their non-traditional credentials—believe that restraint needs to be exercised. Partly, this is for practical reasons (because upsetting “feeder” schools could be self-sabotaging); however, ethical arguments are also deployed (because affirmative action is regarded as no less problematic than any other form of discrimination). Tamsin characterises the discipline as “generally left leaning”, and Graham’s attention to widening participation is implicitly framed as naïve within a competitive, brand-sensitive environment. When asked about her own background, Kelly’s response captures both a strong working class identity and conviction in the transformative potential of higher education. Unlike other interviewees from similar backgrounds, however, her narrative also draws on discourses of individual aspiration and self-realisation. Later in the interview, Kelly recounts a telling exchange between herself and a candidate: “I had one girl who actually came to me and said ‘I’ve been told that it’s a disadvantage to go to a private school’ and I said ‘actually, no it isn’t because I don’t look which school you come from’.” While Kelly’s rejoinder may seem to conflict with the advice from her “old admissions tutor” and with her professed support for contextualisation, it affirms a broader sense of class-blindness that is consistent with—and perhaps driven by—personal pride in her own children’s success. As such, the reported exchange captures the complexities and subtle paradoxes that form part of the identities of admissions staff, and perhaps points to ways in which passed-down discourses of fair play do not always translate straightforwardly into professional practice. Whereas interviewees from less advantaged backgrounds tended to advertise their working class credentials, Lucas buries his identity references (“my middle class parents”) within broader observation about the stratifications of the UK higher education system and some applicants’ inability to grasp them. The rule of thumb relating to institutional quality handed down by his parents is precisely the kind of insider knowledge that equips some young people to play the admissions game successfully while others struggle to recognise its implicit rules. Lucas later warns that “you’ve got to make sure that you don’t actually shoot yourself in the foot and also undermine the WP process by bringing in students that aren’t going to be able to meet the rigours of the course itself”. With such statements, Lucas confirms that although he is fluent in the language of diversity, he remains cautious about compensating for prior educational disadvantage. Sheila’s anecdote signals the way in which young people from non-traditional academic backgrounds are often less able to envisage their wider educational trajectory and are more likely to reach decisions based on local factors. She speaks freely about how her own personal experience motivates her current work. However, unprompted, she then recalls an academic colleague reminding her that “we’re not all social workers” and segues into arguing that the system is, in fact, equitable for all applicants. The “contextual data thing” is an institution-wide intervention that allows the discretionary dropping of one grade for non-traditional students. For Sheila, it has never “had to” be used; her only concession is the printing-off of a sheet. She then goes further, disclosing that, on a personal level, “it annoys [Doug, the academic lead] and it annoys me” because “some [students] aren’t doing the right subjects / some haven’t got the correct predicted grades / but they’ll come back to you if we miss that it’s a flagged applicant / they’ll come back and say ‘you’re supposed to make me a lower offer’”. Irritation with candidates seeking clarification about how the intervention works, or appealing against its outcomes, points to more fundamental misgivings about the underlying principle of contextualisation. Despite describing himself as having “personal sympathies with that agenda” because he “did come from a deprived area [and] went to Cambridge after having gone through a bog standard comprehensive”, Doug also frames the contextual data intervention as “an obligation”. When pressed to expand, he obliquely reflects that “there are quite a lot of issues with positive discrimination that we need to be very careful with”. Within the discipline, this results in an admissions process that assuredly speaks the language of social justice, as legitimated by first-hand experience of educational disadvantage, but nonetheless positions widening participation measures as needlessly imposed obstructions. By making soft concessions to applicants from less advantaged background, staff are able to reconcile their personal values with their institution’s attainment priorities. But by shunning the structural changes that might allow more socially diverse cohorts to emerge, it is possible that the elitism purportedly avoided is, in fact, reproduced. When it comes to who does what, how it is done and why, admissions processes remain an occluded and stubbornly private field of practice. This is both because they tend to occur at a more devolved level than other institutional activities and because they tend to be undertaken by small groups of individuals, where private views can hold greater sway. Mountford-Zimdars offers many valuable cross-cultural insights, noting that admissions staff in the USA willingly acknowledge their own personal histories as integral to their role whereas their UK counterparts are more reticent when it comes to such connections (2016, p. 25). A significant contribution of this study is to present more expansive responses from staff within the English sector. The three sites presented, though all situated within the same institution, demonstrate the breadth of discourses invoked, approaches favoured and practices implemented in the field. At the first site, admissions for an Arts-based subject was found to be academic-led and underpinned by a professed commitment to social justice. In some ways reflecting traditional conceptualisations of the university as a civic institution (Newfield 2008; Cribb and Gewirtz 2013), management attempts to centralise and standardise processes were resisted; instead, the public good, as demarcated by Barnett (1990) and Holmwood (2011) among others, was emphasised and ostensibly safeguarded. Non-academic indicators of potential were dismissed as being as much a reflection of prior educational and socio-cultural privilege as academic ones (Jones 2013). However, at the site, dissenting voices were beginning to be heard, with newer and more junior colleagues characterising the dominant approach as politically motivated and market-naïve. In our other two case studies, a different set of dynamics emerged. Within the Social Science site, we found evidence of competing agendas. A political instinct to widen participation was felt sharply by non-academic colleagues, but an incoming academic lead pushed for the agenda to be operationalised in ways more consistent with key institutional metrics. Testimonies from staff particularly bring to mind Buddel’s (2018) work on “storied futures”, and the extent to which higher education is viewed as a natural route for some young people but a peculiar diversion for others. Localised sensitivity to socio-economic factors was perceived to be under threat, with discourses of merit (Guinier 2016) gaining traction. And at our final site, a Physical Science discipline, though staff were fluent in the discourse of inclusion and diversity, the perceived need to maintain “standards” and “quality” ultimately took precedence. More tangible interventions were positioned as unnecessary, intrusive or reflecting the kind of “reverse discrimination” against the middle classes invoked by opponents of affirmative action in the USA (Mountford-Zimdars 2016). The “sincere fictions” reported in other professions (Winant 1994), in which status-quo affirming actions are legitimated by well-intentioned mythologies, may allow initial theorisation of the ways in which a high-performing discipline can mollify itself with identity-driven rhetoric about widening participation without addressing structural barriers. As Schuman et al. note, gaps can arise between “verbal approval of high-sounding principles” (1997, p. 121) and “levels of support … whenever concrete action is proposed” (1997, p. 137). In many respects, this is what market rhetoric does: it deploys a language of fairness while its processes tend to entrench hierarchies. Throughout all three sites, we encountered staff who brought a deep personal investment to their work. Though only Graham had actively sought an admission role within the university, and such roles were universally felt to be under-valued relative to parallel roles in research, most interviewees talked freely about their own experience of overcoming educational disadvantage. What happened next, however, was not predictable. For some, their narrative of social mobility, starting from a non-traditional background, made it natural to offer a helping hand to young people in a similar position. For others, it led to cynicism about the idea of positive discrimination. Merit-based rhetoric was common (Guinier 2016), as was recourse to discourses about lower attaining students from lower attaining schools being unable to cope with the academic expectations of an elite institution. However, the main tension that emerged was that between a personal instinct towards diversity and fairness and an institutional steer towards competition and excellence. Integrity in admissions, and indeed the wider notion of social justice, was perceived to be under threat from an agenda that unproblematically positioned entry grades as an indicator of institutional quality (Marginson 2007). The extent to which differences between self-reported behaviours at the three sites arise from disciplinary traditions, institutional demands or local cultures—or from complex permutations of such factors—is difficult to gauge. However, we do not attribute variation to the individual idiosyncrasies of the personnel involved. Rather, we see a trend for staff to reposition themselves, and renegotiate aspects of their identity, in response to an array of perceived forces. These forces can be internal, driven by class-based, personal habitus (Bourdieu 1990), or they can be external, with institutional habitus (Reay 2004, 2015) exerting new pressures on agents within the field. Where this leaves the widening participation agenda is unclear, not least in the minds of those whose professional role essentially involves acting as gatekeepers for an elite institution. For Sheridan, only by revealing what lies beneath the “professional coating of academic armour” (2013, p. 568) can we understand how policies are interpreted and enacted in higher education. Practices within the admissions sphere are particularly difficult to penetrate given high levels of institutional autonomy and applicant confidentiality. This article has attempted to unpeel some of the protective layers worn by admissions staff within one selective university in England. Most of our participants explicitly connected their professional role to a personal identity, but the nature of this connection was not uniform, and the practices it led to were assorted. For some, such as Graham, the goal was a more socially just, less exclusive admissions process: “I would like to see the university be bolder / there are times it is fearful of hostile stories in the Daily Mail and the Daily Telegraph.” However, based on interviewees’ recollections of previous eras, the proportion of staff that espouse such values, and who retain sufficient autonomy to apply them, appears to be diminishing. Graham’s vignette and the others presented in this article capture something beyond localised strains in the enactment of national policy and the operationalisation of university strategy. Rather, they feed into wider debates about a range of issues: academic freedom in the neoliberal university (Marginson 2007; Rustin 2016); higher education as a public good, with a public service ethos (Newfield 2008; Scott et al. 2016); and the extent to which the sector is responsible for contributing to society’s broader goals, such as those around social mobility (Archer 2007; Milburn 2012). Fitzmaurice discusses the “values, virtues and beliefs” (2013, p. 621) that shape academics’ identity, and our findings suggest that work in admission, both by academic and non-academic staff, is particularly influenced by background ideologies, albeit in varied and intricate ways. One area in particular need of further attention is that of the professional identities of non-academic university staff. Though our interviewees did not technically fall into the “third space” category identified by Whitchurch (2006), the admissions activity is replete with “blurred boundaries”, as academic and non-academic staff vie for ownership of processes. Like Whitchurch (2008), we regularly witnessed standing being established rhetorically rather than through organisational structures, with credibility built on personal values rather than job titles. Evidence of “incongruence” (Deem et al. 2007) within academics’ professional identity was commonplace, as institutional pressures demanded a different professional identity be assumed to that taken outside of the admissions sphere. Fanghanel gives voice to concerns that subject areas are compromised by production ideologies seeking to frame the job of universities in exclusively instrumental terms—“the discipline ceases to be a discipline when it is perceived simply as a utility” (2012, p. 77)—and many of our participants felt strongly that higher education should have a purpose beyond credentialisation and status enhancement. However, other staff were more compliant with institutional agenda, and the way in which admissions personnel performed their role did not break down neatly according to established professional roles (academic vs non-academic) or the boundaries between them (Whitchurch 2006). Nor was seniority found to be a predictor: at one site, junior colleagues were noticeably more sympathetic towards institutional agenda, but at the other two sites, no clear pattern arose. Individual aspiration and family-based discourses were highly influential, and cross-generational trends were accordingly difficult to pinpoint. Emerging from this study, therefore, are complicated intersections between personal biographies, professional identities and organisational allegiances. The dispositions that admissions staff from non-traditional background bring to their professional role operate along a continuum, ranging from the class-compensatory to the obdurately meritocratic. However, more work needs to be undertaken for the competing—and sometimes contradictory—forces that shape individual approaches to be better understood. One possibility is that more meritocratically oriented non-traditional staff share similarities with the working class Conservatives analysed by Parkin (1967) and Nordlinger (1967). Our initial evidence certainly suggests that staff from a non-traditional backgrounds are navigating the cross-pressures of an admissions role differently from other colleagues. We are aware that the single-institution context of this study is a limitation: Nixon (1996) discusses the differences in professional identities between staff at “new” and “old” UK universities, and it is likely that many nuances would emerge were this research replicated at comparator institutions with different kinds of “mission”. We are aware also that at all three of our sites, the academic lead was male, with female colleagues seemingly less influential in decision-making hierarchies. Following Blackmore and Kenway’s (2017) important work on gender issues in educational administration, the dynamics involved with admissions processes would benefit from closer attention. In higher education landscapes increasingly driven by international competition and subject to ever closer scrutiny from policymakers and media commentators, it is vital that progress made in widening participation does not stall, or even reverse. Questions about where influence over admissions really lies—at institutional or discipline level? with academic or non-academic personnel?—formed a constant backdrop to our interviews. In all kinds of ways, personal identities were found to shape and rationalise professional activity. For some of our interviewees, universities were instruments of social change, of the kind discussed by Bathmaker et al. (2016), offering the upward mobility that Milburn (2012) regards as necessary to disrupt young people’s social fate (Buddel 2018). For others, responses betrayed a less progressive conceptualisation, with the link between educational opportunity and social class, as exemplified by Savage (2015) and others, largely uninterrupted by policy enactment (Ball 2015). A commitment to even-handedness in admissions was evident throughout this study, but views on how this should be operationalised differed markedly. Barriers to more equitable distribution of places at university were felt to arise in the shape of both management policy and its interpretation by colleagues. At such moments, some admissions staff tended towards institutional language (Collini 2017), seeking to locate equity at the point of admission and framing widening participation in terms of individual rather than structural realignment (Burke 2013). One familiar—and very sincere—fiction was that fairness could be achieved without troubling the passage of traditional applications to elite universities. Within this perpetual renegotiation of personal and professional values, social issues often become marginalised or muddied. 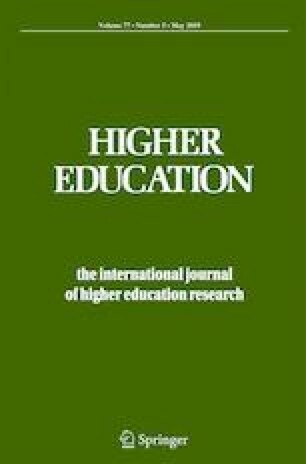 The challenge for higher education is to create mechanisms by which the energy and dedication of admissions staff, like all staff (Cribb and Gewirtz 2013), can be harnessed and united behind approaches that speak to notions of the university as a public good (Giroux 2002; Holmwood 2011) and meaningfully address issues of social justice. In higher education, “non-traditional” is used in different ways by different authors to characterise historically under-represented groups, ranging from mature students (James and Busher 2017) to student athletes (Jahn et al. 2017); here, the term is applied particularly to staff and students from lower socio-economic backgrounds. It should be noted that the US and UK undergraduate admission systems are far from identical. Rarely do academic staff in the USA lead on admissions decisions (Mountford-Zimdars 2016). Only one of the staff members we approached declined to be interviewed. Universities in England usually make “conditional” offers, requiring candidates to achieve a particular entry tariff or set of grades to be accepted. Unconditional offers require no attainment threshold to be met. They were not used by the host university at the time that the research took place. The targets to which Lucas refers are institutional ones for admitting a minimum number of undergraduate home and overseas students meeting agreed entry criteria. The authors are grateful to their anonymous peer reviewers for supportive and astute feedback. Milburn, A. (2012). University challenge: how higher education can advance social mobility. A Progress Report by the Independent Reviewer on Social Mobility and Child Poverty. https://www.bl.uk/collection-items/university-challenge-how-higher-education-can-advance-social-mobility-a-progress-report-by-the-independent-reviewer-on-social-mobility-and-child-poverty. Accessed 28 June 2018. Schwartz, S. (2004). Fair admissions to higher education: recommendations for good practice. https://www.spa.ac.uk/resources/schwartz-report. Accessed 28 June 2018.